Features Fluid, Two Column, Pink, Right Sidebar, Love. 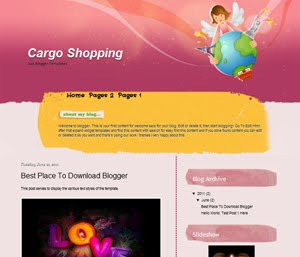 Descriptions Cargo Shopping is free blogger templates with two column, right sidebar, feature post, elegant design and with blue gradient with combination green. If you want find elegant blogger themes with good design you can try using this themes for your blog.